The Academia Europaea Knowledge Hub Wrocław collaborated in the “200 years of the Cracow Learned Society” conference. The event was organised by the Polish Academy of Arts and Sciences, in collaboration with Jagiellonian University and Academia Europaea. The event was held on December 9-10, 2015 in Kraków, Poland. As Duchy of Warsaw has been abolished, Congress of Vienna on 3rd of May 1815 established Republic of Cracow as independent and constitutional Polish political body. Almost immediately after that the idea of creating corporation of scientists was made. On 9th of December 1815 “Dwory Opiekuncze” of Austria, Prussia and Russia confirmed it by law. This date is acknowledged as the date of the Cracow Learned Society formation, although activities were undertaken on February 1816. The Cracow Learned Society is much older than other scientific societies established in Poznan, Torun or Lviv. It represents the continuity of Polish scientific tradition. Scientific Society in association with Jagiellonian University and its successor Cracow Scientific Society and then Polish Academy of Art and Sciences has not only national range, but also international nature. This is supported by topics taken into research and international collaboration. Even the paintings on the assembly hall’s ceiling (which was originally built with public donations in the mid-nineteenth century on Sławkowska 17 street) confirms the ideological agenda of the Polish Academy of Art and Sciences main building. Painting shows emblem of the first Republic of Poland. Conference was not only renew the Cracow Learned Society tradition but also was aim to broaden knowledge about its heritage: its committees (balneological, physiographic, anthropological, bibliographical, linguistic and historical, etc. ), its archeological and conservatory interests, its publications (44 volumes of “Year Book”, 8 volumes of “Medical Review”, etc. 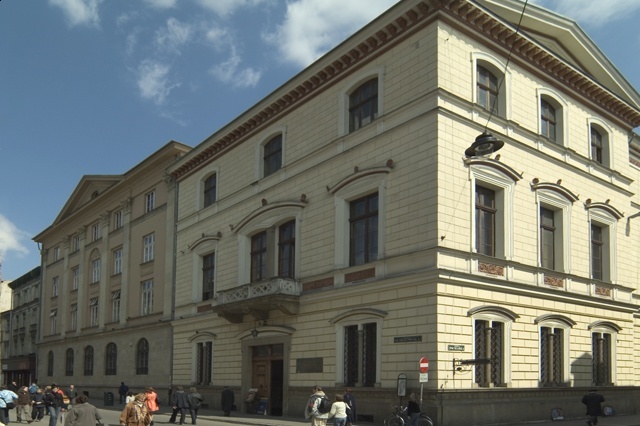 ), valuable archives and libraries (Scientific Libraries of the Polish Academy of Art and Sciences and the Polish Academy of Sciences in Cracow). Another field of our interest focused on generosity of society in the name of science. The conference was addressed both to the world of science, as well as to the wider audience, particularly young people. We emphasize the fact that our session is very important in terms of history of science and history of development of scientific research in Poland.